Part of a poster for a September screening of “Right of Passage” at the National Press Club in Washington, D.C. 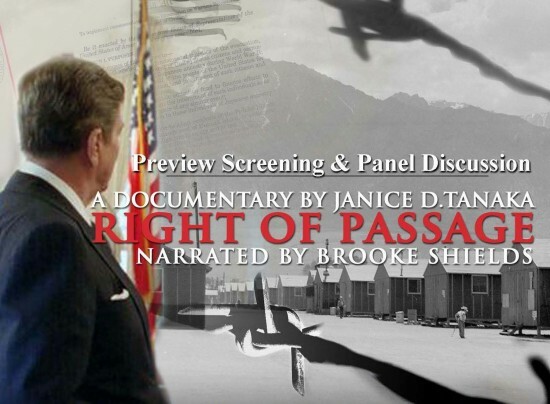 Recently, I was invited to a screening of “Right of Passage,” a documentary on the complex legislative strategy that led to the enactment of the Civil Liberties Act of 1988 (aka “redress” or HR 442). I found the documentary to be seriously flawed in that it fails to recognize that it was the emotional connection that President Ronald Reagan had with a 1945 ceremony in which he participated to honor a 442nd Regimental Combat Team soldier killed in action that made redress a reality for the Japanese American community. The DVD also fails to give any credit to the two individuals who changed President Reagan’s mind, which resulted in him signing HR 442 into law. One of the almost insurmountable obstacles facing the proponents of the redress legislation was how win over President Reagan, who had announced two years earlier that he would veto the legislation if it were passed by Congress. The DVD concludes that “what changed President Reagan’s mind is a mystery.” In fact, there is no mystery. The decisive strategy that changed the president’s mind was developed by Grant Ujifusa, who was the strategy chair of the JACL Legislative Education Committee, formed to support the efforts to pass the redress legislation. Ujifusa knew that Reagan, as an Army captain, had participated in 1945 in awarding the Distinguished Service Cross to the family of Sgt. Kazuo Masuda, a member of the 442nd RCT who was killed in action in 1944. The town fathers of Fountain Valley, Calif. refused to allow Masuda to be buried in its cemetery until Gen. “Vinegar” Joe Stilwell personally intervened, resulting in Sgt. Masuda being buried there after the award ceremony that took place on the porch of the Masuda family home. Ujifusa felt that if Reagan could be reminded of his participation in the ceremony honoring Masuda, he might change his mind. Ujifusa recruited the help of his friend, then New Jersey Gov. Tom Kean, who used a special line of access for Republican governors to send the president a letter from June Masuda, dated Nov. 19, 1987, reminding him of the day that he participated in the ceremony honoring her brother. During the fall of 1987, Gov. Kean spoke face to face with the president on several occasions to urge him to reconsider and sign HR 442. The strategy worked. In a Feb. 14, 1988 meeting with Ken Duberstein, Reagan’s chief of staff, Ujifusa was informed by Duberstein that the president had changed his mind and would sign the legislation. About the same time, Kean received a call from Reagan informing him that he had read June Masuda’s letter, remembered the events related to Kaz Masuda, changed his mind, and would now sign the redress legislation. The DVD fails to give Masuda and the other Nisei soldiers who all served with valor during World War II the credit for the success of HR 442 that is owed to them. The significant roles that Ujifusa, Kean, and June and Kazuo Masuda played in changing the president’s mind are not included in the DVD although Ujifusa and Kean were interviewed for the DVD. The DVD’s narrative is factually flawed by failing to give credit to Ujifusa and Kean for their contributions. Rather, the DVD misdirects the narrative by creating a false “mystery” by asking whether the president watching the 1955 film “Bad Day at Black Rock” or a meeting with Sen. Alan Simpson might have changed the president’s mind. Ujifusa was awarded the Order of the Rising Sun in January 2012 for reversing Reagan’s opposition to HR 442. The DVD appears to challenge the judgment of the Consulate General of Japan in New York, the Japanese Foreign Ministry, the Japanese prime minister, and the Japanese emperor that Ujifusa and his efforts were the critical factor in changing Reagan’s mind. Finally, “Right of Passage” fails to present a fair and balanced approach in concluding that Mike Masaoka, a JACL wartime leader, suggested that Japanese Americans be “branded or stamped” in order to participate in a farm release program in the Midwest during World War II. The DVD relies on JACL minutes from a special emergency meeting held in March 1942 reporting on the Tolan Committee hearings on the West Coast. The DVD does not state that Masaoka denied this allegation in 1988. Nor does the DVD include the finding reached in the Lim Report, published in 1990, that analyzed the same JACL minutes and found that it could not definitely conclude that Masaoka made the suggestion. By simply stating its own conclusion based on its reading of the JACL minutes and without any further analysis or supporting evidence, the DVD presents its biased view on a disputed point not relevant to a documentary on redress. Gerald Yamada is principal at Going Forward Strategies in the Washington, D.C. metro area. Opinions expressed are not necessarily those of The Rafu Shimpo.